Supports the most current Flash drive capacities on the market (Over 18TB+). 3 Data Wiping Modes: Quick Erase, Full Erase and DoD Erase. Standalone device, no PC required for operation. Extensive Flash-Media testing & diagnostic tools. U-Reach Super U3 series USB 3.1 duplicator contains groundbreaking technology in the transfer speed. 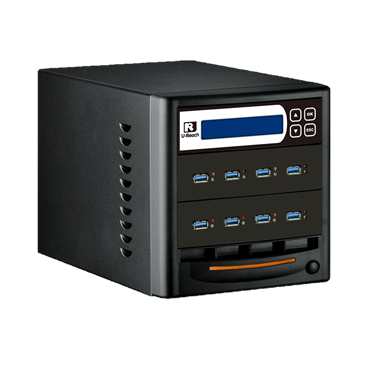 It supports duplication from 7 and up to 47 pcs, and the transfer speed is up to 16 GB/min. Its effortless use means a PC or other software are not required; and no risk of virus infection. As the copy is done with bit-by-bit copy mode the result will satisfy the user at any time. With the copy & compare function, you can even be 100% sure your new targets are exactly the same as your master. If you are looking for duplicators with faster copy speeds or higher target numbers, please let us know or check out our other product lines. We'll be happy to point you to a solution that matches your duplication needs. Our dupliacators are standalone devices. Just plug in the power cord of the system, turn on the unit and start the production. The unit is operated with the internal Controller with 4 buttons and an LCD display which is very easy to operate. For all our units U-Reach offers free firmware updates so we make sure there is a high compatibility to new chips and controllers in the market. U-Reach USB3.1 Tower duplicator is capable of copying at 16GB/min (260MB/sec) (Non PC-based). It is specially designed for USB3.1 devices, and the real high-speed transmission enables high volume USB-Hard Drives duplication in amazing efficiency. 2. Whole media: Bit-by-bit copy mode which copies exactly like the master device. Supports al proprietary and unknown formats. H2 / H5 Test: Checks the flash’s quality by reading and writing. Quick Erase: Erase HDD index table, and only takes A FEW SECONDS to complete. Full Erase: Erases the entire Hard Disk Drive. DoD Erase: Complies with U.S. Department of Defense erasure standards. Designed support capability over 18TB+. Compatibilities Compatible Devices USB-HDD / USB 3.1 / USB 2.0 / USB 1.1 USB Sticks.